GSB is a hugely important and influential division, responsible for developing Statoil’s future strategy. Headed up by Senior VP John Knight, it was essential that this newly formed group of some 200 people were all pulling in the same direction. John is highly regarded and very particular about what he wants. In this instance it was nothing short of perfection! With just 10 weeks to conceptualise, plan and organise this two day event in central London, we had a lot to cover if we were going to deliver this on behalf of our client, Enigma. Building on our ethos that events should be interactive and involve the attendees as much as possible, we helped Statoil create a highly engaging town hall meeting, kicking off with a gala dinner the night before overlooking the Thames with the Houses of Parliament and Tate forming the backdrop of what was going to prove to be a hugely successful event. A large, bespoke 4m high stage set was installed with soft-seating areas for more relaxed discussions and a panel table for the debates and Q&As. Compered by the BBC’s hugely popular (and ruthless) Kirsty Ward, delegates were given hand-held devices that they could use to comment, challenge and vote on key topics throughout the day, which Kirsty used to interject and lead the discussions on stage. Voting on key topics took place in real-time and helped form the bases for key policy changes that would be announced by John Knight at the end of the event (to great applause). Contributions came from senior management, guest speakers and presentations from younger project teams advocating their ideas as part of an internal competition. This proved to be the perfect mix for a fun event with a serious agenda, to engage, motivate and inspire its delegates. John even took a moment at the end to thank us for organising the perfect event – a rare thing we’re told – so job done! 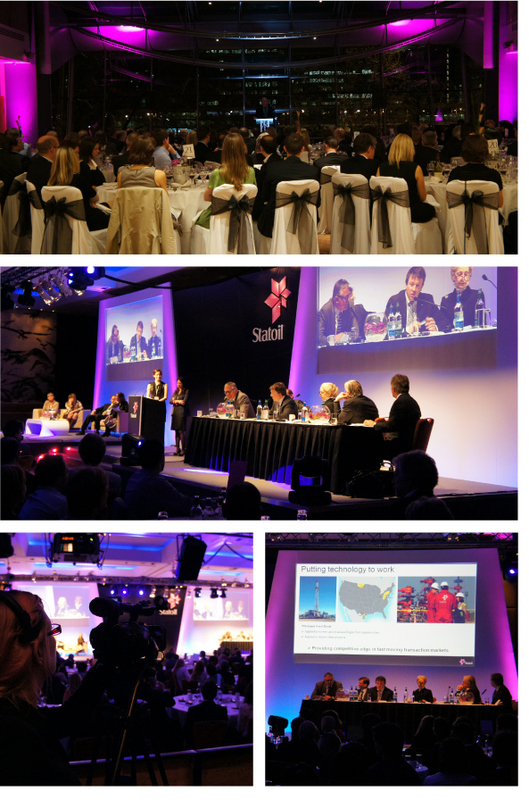 We look forward to repeating this success in future years and wish Statoil every success with its plans.